The patrols were definitely out today. We encountered this Red-shouldered Hawk at the next sign along the road. 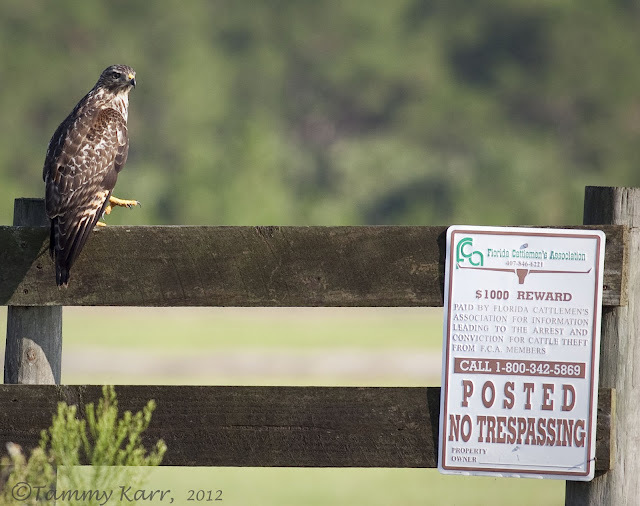 The hawk initially seemed very serious about enforcing the sign, even gesturing to it to be sure we saw it. But, the hawk decided to abandoned its post about a minute later to retrieve something of interest. Next, we came across some cattle that had gone AWOL. They stood in the road for a few minutes, staring at us down, forcing us to ignore the sign and stop. They eventually moved and we continued on. We came across this handsome young man as he wandered along the road. He took off in bounding leaps as we drove along, but it wouldn't be the last we saw of him. These little Common Ground-Doves, along with a handful of others, found the middle of the road to be a wonderful place for a rest. 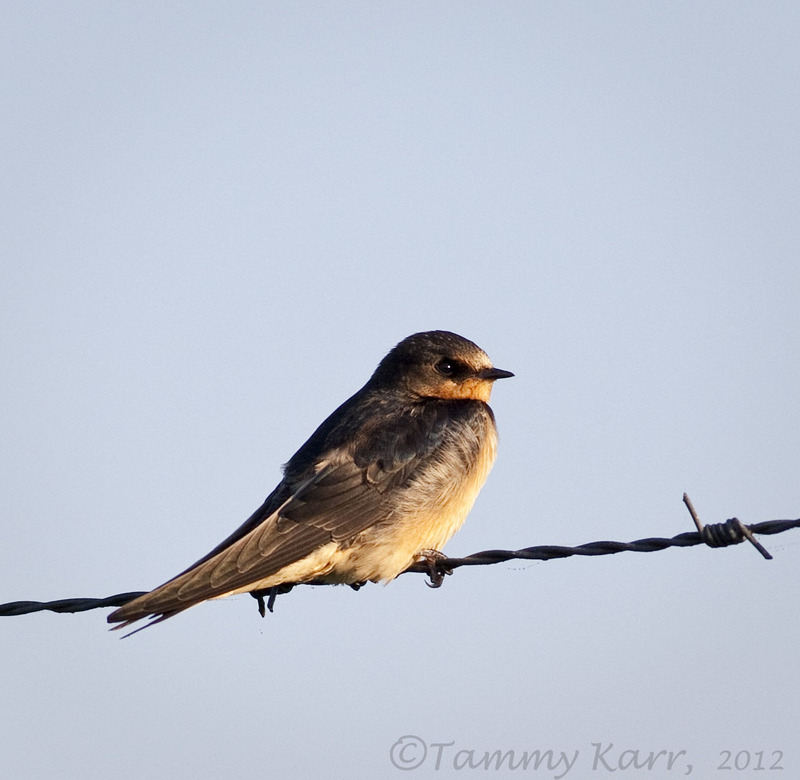 Barn Swallows were everywhere. Many of them were resting along this pretty wire, tired from their daily high paced activity. We arrived at the empty parking area, and decided on a walk up the southern trail. The area surrounding the parking field was full of Eastern Meadowlarks. We didn't end up walking to far as the mosquitoes were really hungry and my son decided stomping in a huge puddle was more fun than going for a walk. We saw the young deer again as we were leaving. It was about a mile up the road from where we first saw it. Once again it decided not to stick around. We made a loop around the Click Ponds on our way out. Things were very low key there. We did see nearly a dozen young Green Herons. 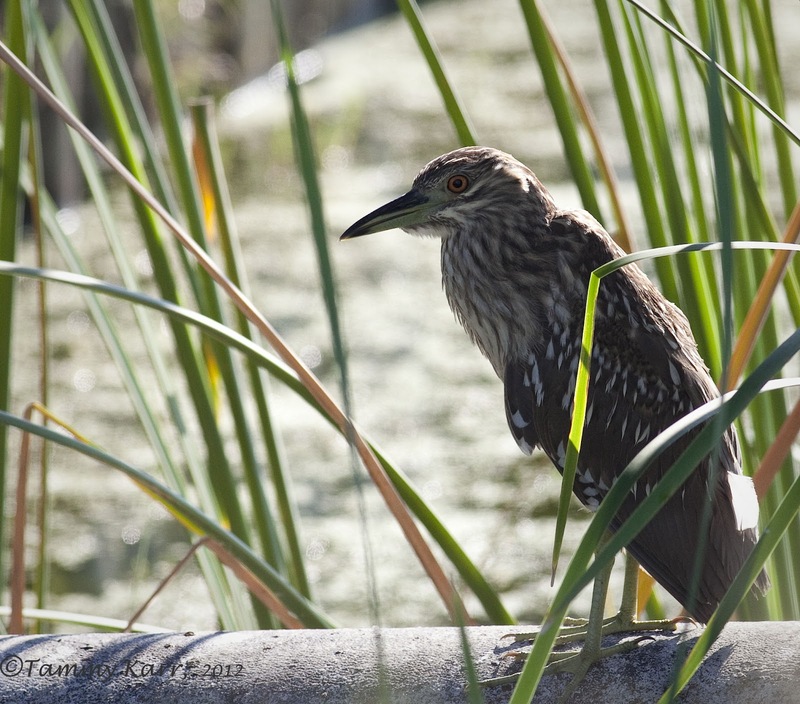 And one juvenile Night Heron. 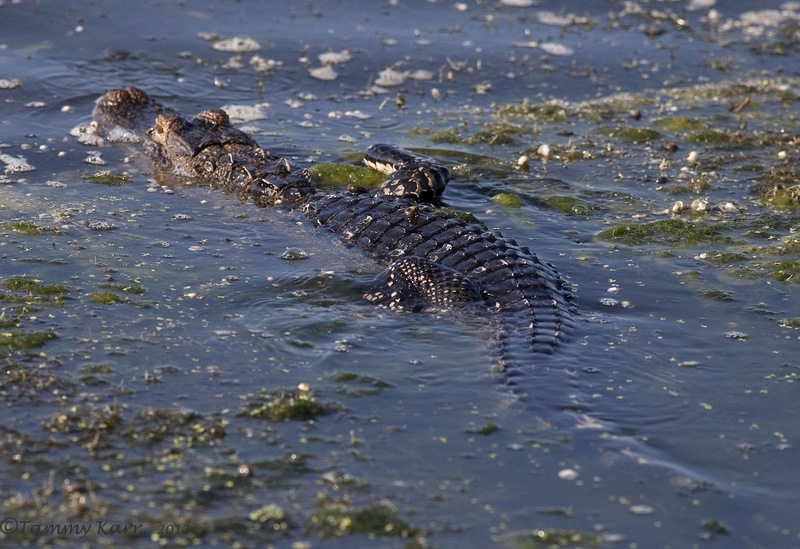 This gator decided it was time for his morning exercise, a few laps around the pond! wow! lots of activity, today! even if some were illegally stopped. :) great catch of the spike buck going over the fence! always a pleasure to view your photos! Like the deer jumping pics very good, the light in the hair on the nose is great. I am still impressed of the diversity in your wildlife. Have a nice weekend, Tammy ! Compliments for this lovely serie photo's, i like this work very much. 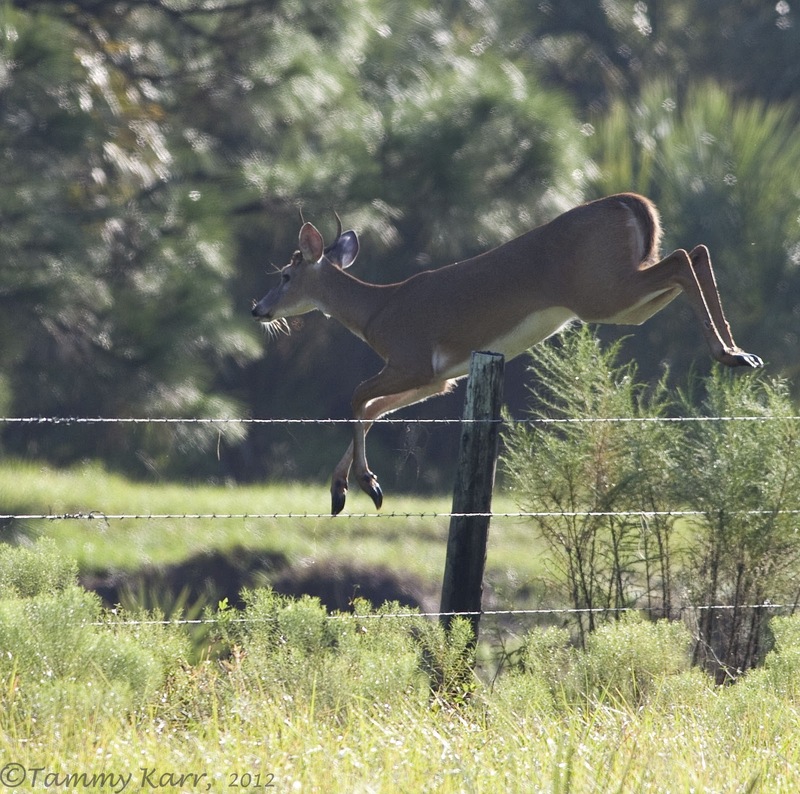 The deer jumping the fence is breathtaking! Give-me a sec while I pick up me jaw off the floor. You and your company must have been amazed at the sight. Sharp stuff Tammy! Raptors on signs are great! Brilliant Tammy, such a lot to see ou there. Love the jumping Deer shots. Really cool shots of the birds and signs, but the pics I like best are the deer pics, lovely shots, and I like the way the light caught the wiskers. Great shots all round Tammy, all the best Gordon. My goodness........theses are awesome! So cool that you caught the deer jumping! What an eventful trip! I can't believe you get to see such a variety of animals. 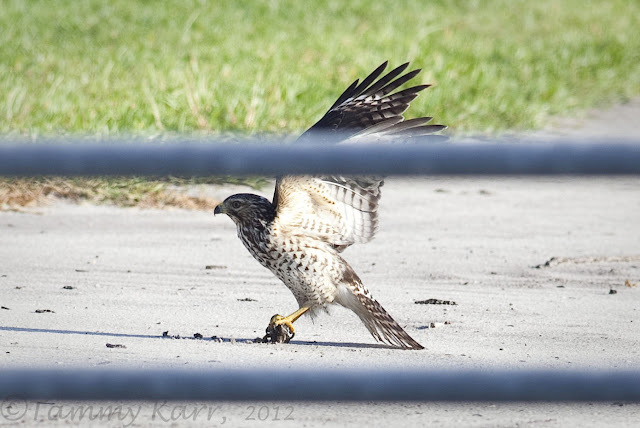 I love the shot of the hawk gesturing toward the sign, hehe. Your photo of the barn swallow is so peaceful, as if he's lit by the setting sun, while the meadowlark looks as if he's carrying the sun away on his chest. The gator, well, looks scary, just as he should :) Thanks Tammy. Tammy, super sweet post!!!! 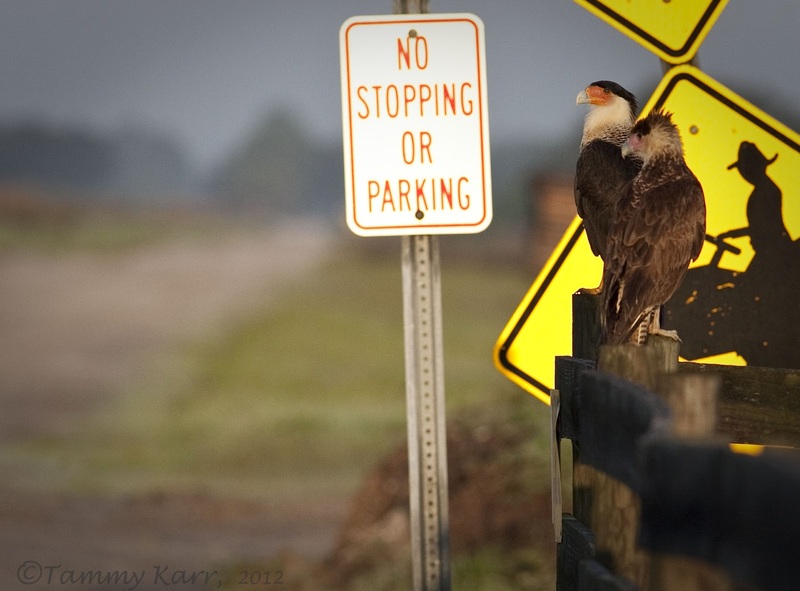 What a photo bonanza of great shots...caracara, deer, gators....excellent all of them. Favorites? The deer jumping over the wire, the gator, and especially the Caracara shot.....that is truly amazing...frameable and poster worthy! Love the sign theme! Those are awesome photos! 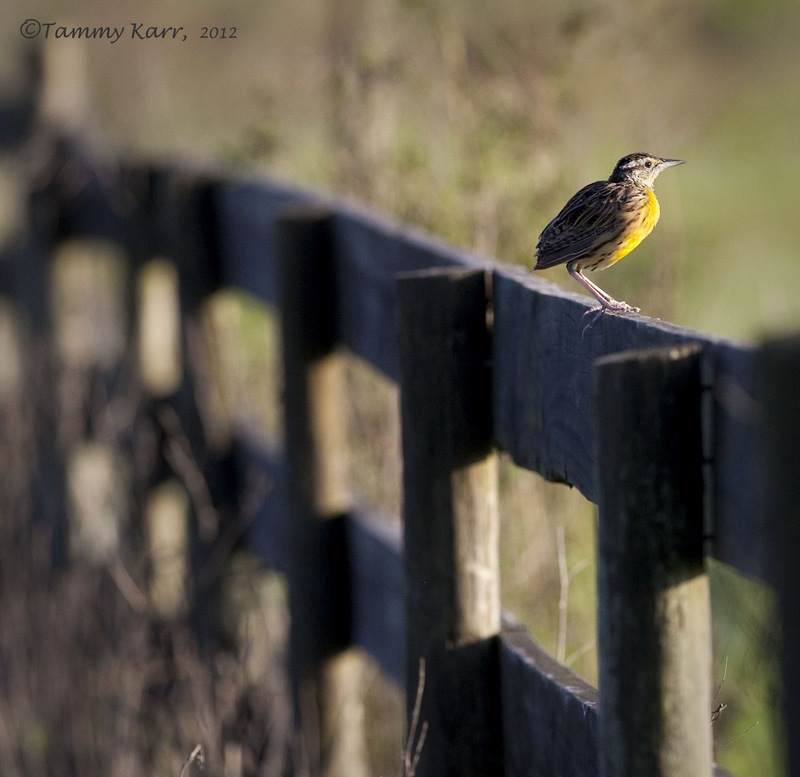 The meadowlark shot is beautiful with the fence. That's one I'd frame. Same with the deer jumping the fence! Fantastic! 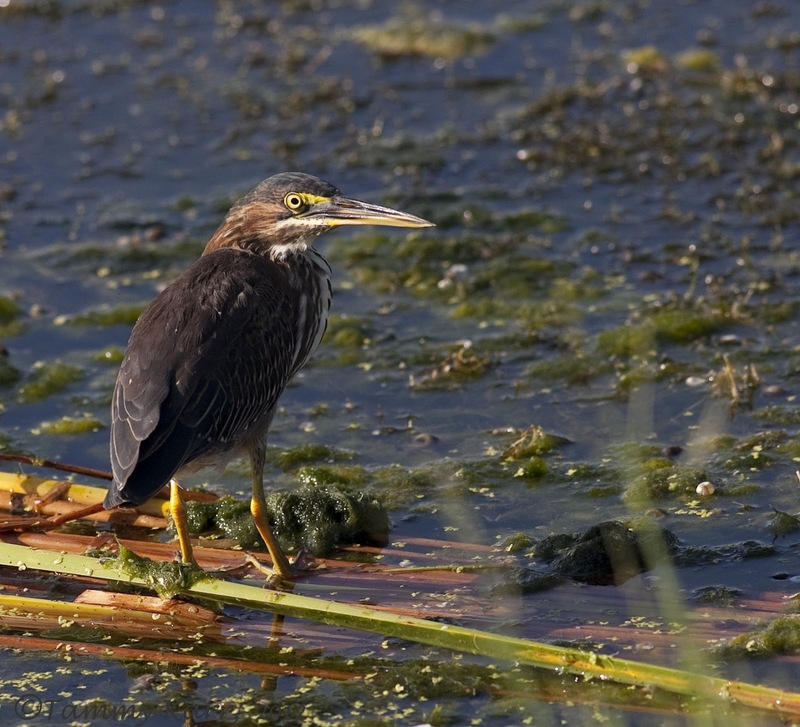 I like the gator and Green Heron, too. Nice blog and great pictures. 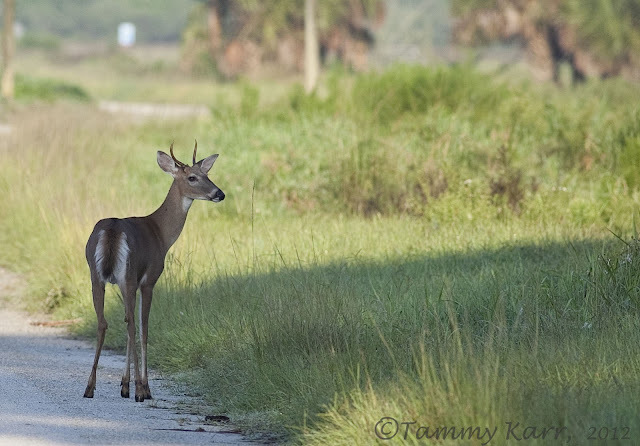 Lovely shots as usual Tammy, the first deer shot is a beauty! What a fun day out!! Love the shots with the signage! Lovely shots as usual Tammy, the pictures of the leaping deer are sublime. A really great selection of pictures love the signs, and the deer leaping. Darn those shy deers.Contiue the grat outings I look forward to seeing the northern section of the state. Love the narration and images Tammy! Isn't it so interesting that some photo outings adopt a theme?! Love the signs! And the bird shots of course, once again while viewing your wonderful shots I cannot wait to get back to Florida and discover good birding spots in the new area that I'll be living once hubby and I finish our 4-month job elsewhere. 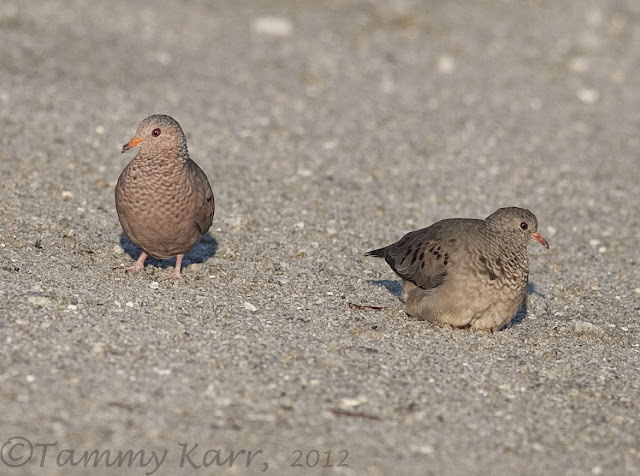 Hola Tammy otra serie fotografica de la variedad de especies que viven en tu querida Florida,como ya te he dicho en varias ocasiones estas en el paraiso de las aves.Un abrazo. Very nice! 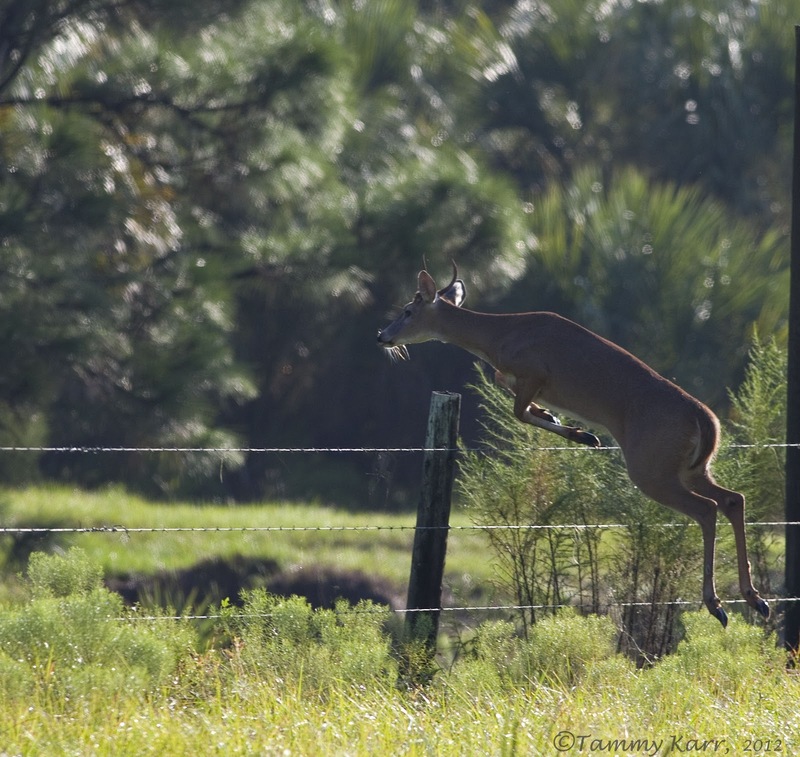 I really like the shots of the deer jumping the fence! Bonitas tomas. Tammy, las dos últimas infunden mucho respeto. Well Mocassin Island seems like a paradise of its own! 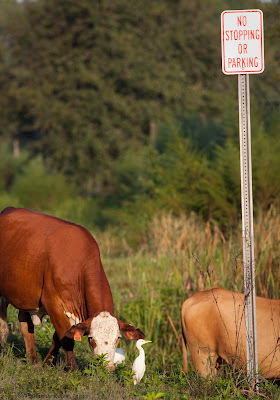 Great picture again and managing the animals by the signs is quite funny! I wish I could get that close to herons too, lucky you!! A nice post to discover as I am back into the blogging game! Lovely photos, Tammy. Especially like the deer caught in 'mid-flight' jumping over the fence. 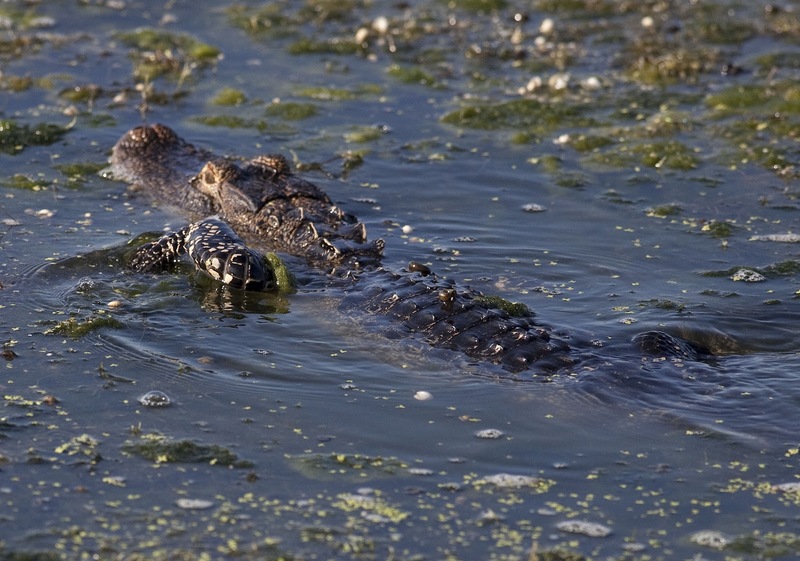 Hope you didn't get too close to that 'gator! You encountered some wonderful creatures on Moccasin Island. I especially enjoyed how you caught the deer leaping over the fence. Each one a beautiful shot, Tammy. Buena y variada entrada, saludos. wow, you were right ready for the jump of the deer :-) The pictures with the birds and the signs are so funny.. it seems that for the Nature there are no limits.. The barn swallow is sooo sweet, as the white tailed deer.. Some beautiful encounters with so many creatures. I love visiting your shores and taking in the diverse range of wildlife you have.